Given the growing demand for Islamic finance talent, a number of business schools based in the OIC* are offering Islamic finance related courses and full degree programs. From the 50 leading B-Schools of the OIC, six are offering full Islamic finance related degree/diploma programs. Four of these programs are based in Malaysia. Another 11 B-Schools offer Islamic finance course-work in their general program. * OIC = 57 Organization of Islamic Conference member countries. **Please note this is NOT a comprehensive list of Islamic finance programs globally, but a list of programs offered among the 50 leading B-Schools list. Distinguished exclusive Islamic finance institutions such as INCIEF (Malaysia), The Qatar Faculty of Islamic Studies and others are not covered. A separate ranked list of Islamic finance programs globally will be released in 2012. Any correction requests and updates can be submitted here. 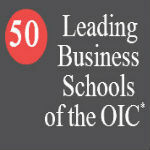 DinarStandard is now surveying for a full ranking of leading B-Schools of the OIC to be released 2012. OIC based B-Schools interested should contact us. The Organization of the Islamic Cooperation (OIC) is an international organization consisting of 57 members states with the goal of being the collective voice of the Muslim world. The below lis is not a ranking but a listing of the most prominent business universities within the OIC member countries. Read more about this listing here. DinarStandard is now surveying for full-rankings to be released in 2012. Universities interested in participating should contact us. You can click on each university page for more details. Analysis: For OIC based employers, top talent is now available in their own backyards. Select Videos – Click here. DinarStandard is now surveying for full-rankings to be released in 2012. OIC based universities that are interested should contact us.